Overview: The Nuba Mountains, in the South Kordofan province of Sudan, are home to a group of indigenous ethnic people groups known collectively as the Nuba peoples. The climate is semi-arid, but lush and green compared with most nearby areas. There are almost no roads; villages are connected by footpaths. 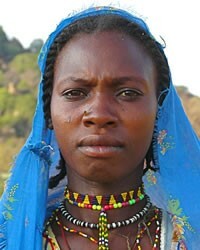 The peoples live in family compounds and make their living through farming and herding. Sunni Islam dominates most of the region, though a few groups follow Christian or animistic beliefs.